Shark Compiler Control by Sören Kewenig speeds up C++ compilation in Visual Studio 2010, 2008 and 2005 using multiple processor cores. It works similar to the /MP switch, but with less restrictions and more convenient control. “The /MP option causes the compiler to create one or more copies of itself, each in a separate process. These copies simultaneously compile the source files. Consequently, the total time to build the source files can be significantly reduced.” /MP is incompatible with several other options including /Gm that enables an incremental rebuild. To test compilation speed up, I used a quad core machine with Windows 7 and Visual Studio 2008 SP1. As a test project I used cryptlib from Crypto++ Library – it consists of 125 .cpp files and doesn’t depend on external components. With default settings this project compiles in 52 seconds. With the /MP option it compiles in 28 seconds. With Shark Compiler Control it compiles in 29 seconds. Almost 2x speed up from parallel compilation. To test parallel projects compilation I created a solution with completely independent 4 copies of the cryptlib project. 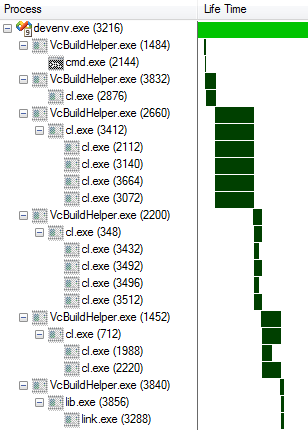 The Maximum number of parallel project builds parameter was set to 4. Solution rebuild with default settings took 62 seconds. With the /MP option – 76 seconds. With Shark Compiler Control – 70 seconds. In this case built-in parallel project compilation already improved performance by significant 3.35x and additional in-project parallelization led to overload. 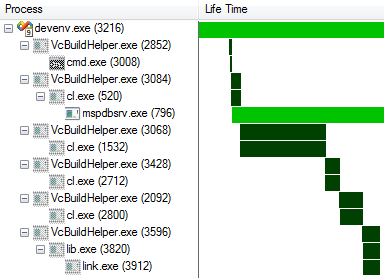 On this timeline we see a very short custom prebuild event involving cmd.exe, then precompiled headers compilation by first cl.exe, then 3 batches of other .cpp files compilation and finally linking. 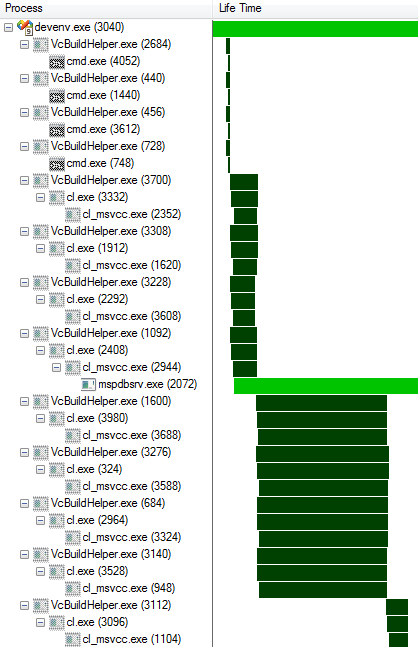 Note how everything is performed sequentially – no processes overlap (except devenv.exe and mspdbsrv.exe which are not interesting to us). It is not visible on this diagram, but each compilation and linking process is single threaded. Only one processor core is used and more cores don’t give any speed up in this case. With the /MP option and Shark Compiler Control you can manually specify number of processes run in parallel within each project. 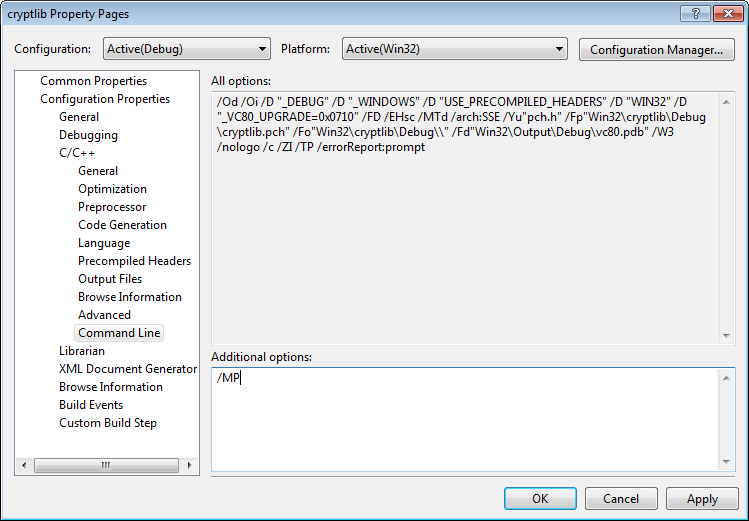 Plus for Shark Compiler Control you can specify number of files to compile in one compiler run. I experimented with different values, but didn’t get a noticeable performance improvement. It will be much better if these parameters were automatically and dynamically adjusted by the tools themselves, depending on current load and available resources. Shark Compiler Control enables you to quickly turn on parallel in-project compilation for your whole solution and compatible with all compiler switches. 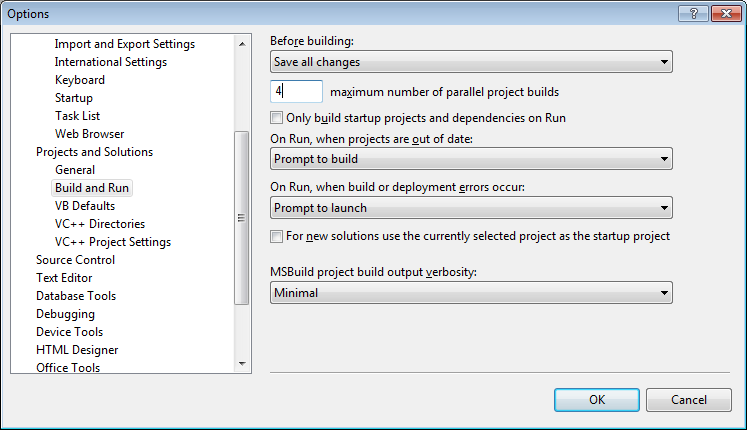 The /MP option is built-in and lets you configure each project individually, for example, you can enable it only for projects that don’t compile in parallel on solution rebuild. Either way you can’t ignore the opportunity to significantly speed up your C++ compilation utilizing multiple cores. 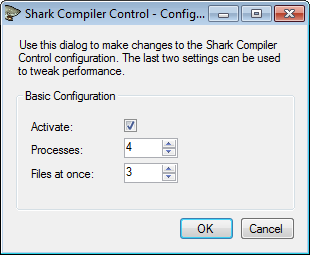 Shark Compiler Control is currently free to use with Visual Studio 2010, 2008 and 2005. You can download it from the official website. This entry was posted in Reviews and tagged C++, Visual Studio 2008, Visual Studio 2010, Visual Studio tools. Bookmark the permalink.